Citation Information: JCI Insight. 2017;2(15):e93358. https://doi.org/10.1172/jci.insight.93358. Myocardial atrophy is a wasting of cardiac muscle due to hemodynamic unloading. Doxorubicin is a highly effective anticancer agent but also induces myocardial atrophy through a largely unknown mechanism. Here, we demonstrate that inhibiting transient receptor potential canonical 3 (TRPC3) channels abolishes doxorubicin-induced myocardial atrophy in mice. Doxorubicin increased production of ROS in rodent cardiomyocytes through hypoxic stress–mediated upregulation of NADPH oxidase 2 (Nox2), which formed a stable complex with TRPC3. Cardiomyocyte-specific expression of TRPC3 C-terminal minipeptide inhibited TRPC3-Nox2 coupling and suppressed doxorubicin-induced reduction of myocardial cell size and left ventricular (LV) dysfunction, along with its upregulation of Nox2 and oxidative stress, without reducing hypoxic stress. Voluntary exercise, an effective treatment to prevent doxorubicin-induced cardiotoxicity, also downregulated the TRPC3-Nox2 complex and promoted volume load–induced LV compliance, as demonstrated in TRPC3-deficient hearts. 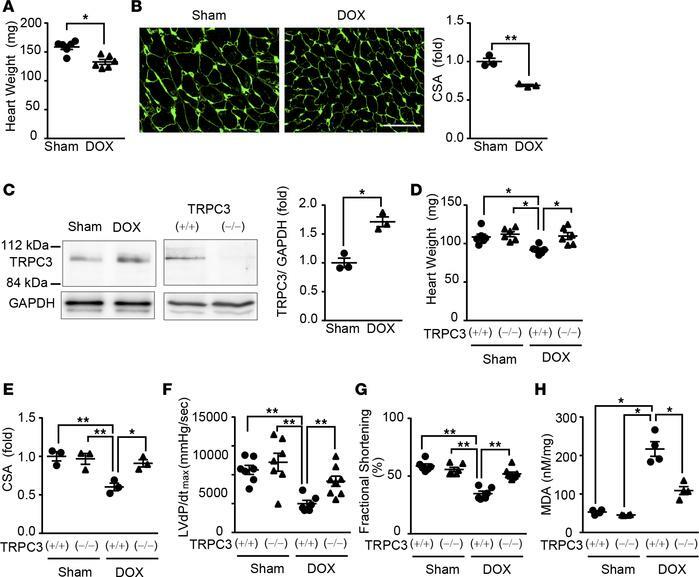 These results illustrate the impact of TRPC3 on LV compliance and flexibility and, focusing on the TRPC3-Nox2 complex, provide a strategy for prevention of doxorubicin-induced cardiomyopathy. Prevention of DOX-induced myocardial atrophy and oxidative stress in TRPC3-deficient mouse hearts. (A and B) Decreases in heart weight (A) and cross-sectional area (CSA) of cardiomyocytes (B) in C57BL/6J mouse hearts 2 weeks after administration of vehicle (Sham) or DOX (n = 6). Scale bar: 50 μm. (C) Abundances of TRPC3 proteins in DOX-treated C57BL/6J mouse hearts (left) and 129Sv-background TRPC3+/+ and TRPC3–/– mouse hearts (right) (n = 3). (D–G) Heart weights (D), CSA (E), and LV contractility (F and G) in 129Sv-background TRPC3+/+ and TRPC3–/– mice treated with vehicle (Sham) or DOX (n = 6). (H) MDA concentrations in mouse hearts (n = 4). (A–H) Data are shown as the mean ± SEM. Significance was determined using unpaired t test analysis in A–C and one-way ANOVA followed by Tukey’s comparison test in D–H. *P < 0.05, **P < 0.01.